The Hanged Man and the "Jewish Execution"
Eventually, Leon was able to locate a copy of Kisch, and the following report is from his site, quoted with his permission. Kisch quotes Von Amira (Todesstrafen p. 105): "There can be no question of [the Jewish Execution's] having originated in the Middle Ages, still less of its having arisen as a particular penalty for Jews. The custom simply persisted longest in this character." As we see it did become, for a time, a punishment that was used primarily on Jews, as a means to not only inflict a more severe punishment but also to emphasize the 'otherness' of the Jew -- "The Jew should be distinguishable from the hanged Christians." (Bruner Schoffenbuch 14th century). 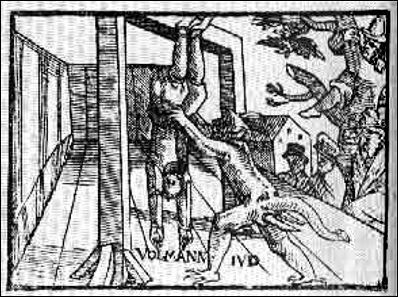 Kisch states that the earliest example of hanging a person by the feet and similarly suspending dogs or wolves at the victims sides, as described in the Jewish Execution, is recorded by Adam of Bremen in his Gesta Hammenburgenesis Ecclesiae Pontificum (ca. 1072-1076). The earliest description of a Jewish Execution carried out in this manner is found in the Annals and Chronicles of Kolmar (1296). I'll post some of those illustrations below. In another thread, I mentioned Heinz Schreckenberg's The Jews in Christian Art (1996). Here are some illustrations from that. This artist may not have been personally familiar with the practice, as the dog in the image is hanged by the neck, defeating its purpose of tormenting the victim. Alternatively, hanging the dog in a more humane and less degrading fashion than the Jew might have been a symbolic statement. 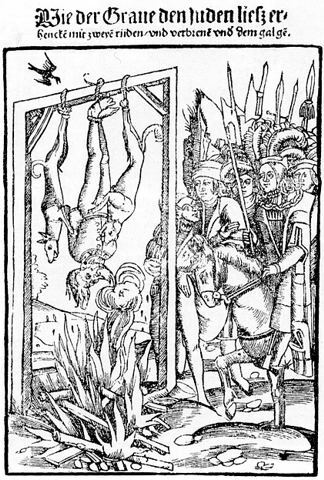 "The Jew Ansteet is hanged upside down with two dogs on 10 July 1553 in Weissenstein, Swabia; woodcut in the Swiss Chronicle of Johann Stumpf, printed in Augsburg, 1586. 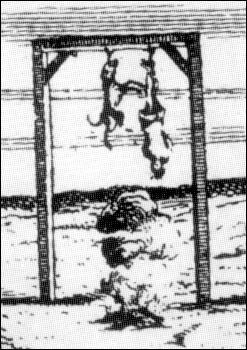 While this form of execution was not exclusively reserved for Jews, in the fifteenth and sixteenth centuries it was preferred for these offenders as a particularly humiliating and painful form of execution, since the dogs, whom anxiety made particularly aggressive in this situation, tended to bite the Jew, who was fettered and defenceless, and inflict severe wounds on him." (Page 360.) Ansteet’s offense was refusing conversion. He was finally persuaded, baptized while still hanging, and "pardoned" by simple hanging with a noose. (Who says Christians don’t show compassion for their fellow man?) Note the close similarity between this image and the one from Murner. While the above images show the Jewish Execution with dogs and/or fire, another iconographic tradition includes demons in images of the Jewish Execution. The two images below were included on Leon Efron's page about the Jewish Execution, (no longer online). Efron quoted the following passage from the Standard Jewish Encyclopedia. 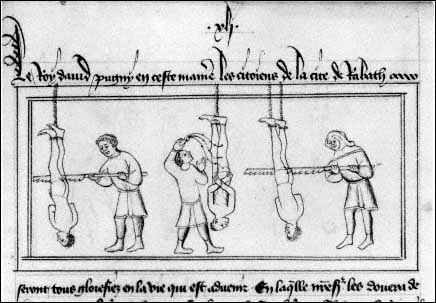 Execution, Jewish: In the middle ages capital sentences against Jews were frequently carried out in an especially brutal manner, the victims being hung not by the neck but by the heels in such a way as to cause maximum suffering. Frequently, dogs were strung up on either side. Traces of the “J.E.” are found in Spain, the Balearic Islands, N Italy and especially Germany. It was known until the 17th cent. 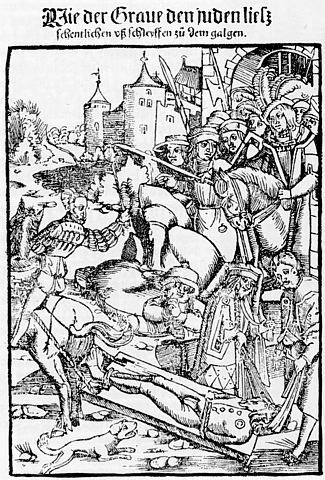 A 1607 illustration of the "Jewish Execution" from the Jewish Encyclopedia. 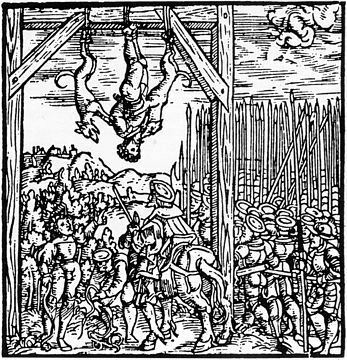 An illustration of the hanged Jew Ulmann from the play Ein Schoen Christlich new Spil von Kinderzucht, by Johann Rassern, 1573. The Devil is removing his body from the gallows. Image from Encyclopedia Judaica, 1972. Finally, a word about the Tarot Hanged Man and the Jewish Execution. At least one Hanged Man image in Tarot was modeled after this so-called Jewish Execution iconographic tradition. The illustration accompanying Thomas Murner's 1515 poem and the image in Johan Stumpf's 1586 Swiss Chronicle (showing the execution of Ansteet), both shown above, derive from the same pictorial tradition. 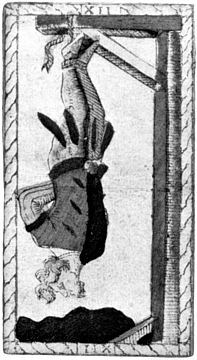 This sixteenth-century German style of Hanged Man figure is also reflected in the 1557 Tarot deck of Catelin Geoffroy. The thing I love the best about these type of threads is how almost no one seems to react to the sheer utter brutality and injustice of these hideous, twisted and repugnant depictions. I find that, to be as bone-chilling as the reality of the images. I think the key is 'seems' - for the brutality depicted is indeed something that is beyond normal comprehension (something on which I have written elsewhere - in the pdf-course). The other earlier thread on a similar topic is 'The Hanged Man... death of a Jew in Christian lands?' - and I do think the sense of repulsion at the depiction is perhaps better reflected therein. Still, we also need to be able to have a 'detached observer' status to the image, recalling that though actual people were (and unfortunately still are) brutally assaulted and tortured, the depiction has to also be considered as image. Looking at the historical reception of such things, two thoughts come to mind. First, and most importantly, it is justice rather than injustice that was being depicted. Although torture was often a private matter, executions -- especially the most dramatic and horrendous ones -- were routinely made into public spectacles. This was a morality play in the public theater. There was usually an opportunity for a display of repentance. Jewish executions in particular usually included the possibility of conversion (which almost never took place) and the incentive of a quick death for the newly minted Christian instead of the lingering death that was planned for the denier of Christ. This was the promotion of public values, and a grand advertisement that justice was being administered in this jurisdiction. A second point is that artistic portrayals of torture and execution during this period routinely prettied things up. It is the nature of art to simplify, to epitomize, and even to sanitize to one extent or another. The horror of these barbaric tortures and executions was very rarely depicted. They were portraying the administration of justice. Of course, most of those depicted -- as has been mentioned before -- were either notable figures or retrospectively identified as martyrs. Common criminals and those without a great story to convey some moral lesson, (i.e., the vast majority of those tortured and executed), didn't find their miserable deaths recorded in words or images. 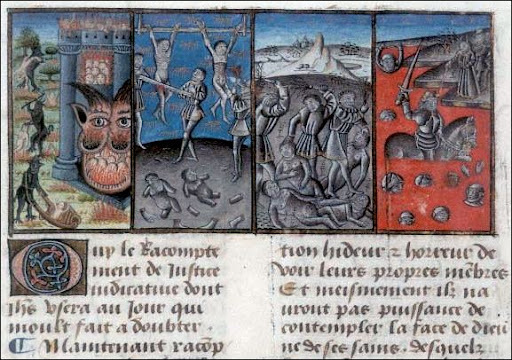 There are later martyrologies which include great pictures of various tortures, punishments, and executions. An Italian one (not surprisingly) has several illustrations of assorted hangings, inverted and otherwise. 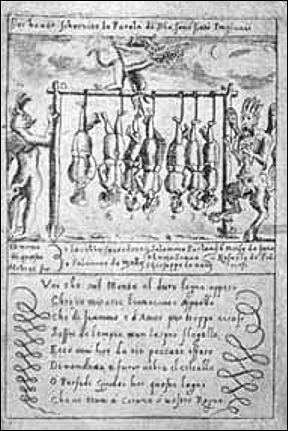 Because these are shown as martyrs, some even include halos, foreshadowing Waite's Hanged Man. Naturally, both nobility and Christian virtue are depicted as stoic in extremis, but that kind of passivity was also commonly shown in anonymous souls being tormented in Hell, so nothing more than an artistic sensibility can be read into most of these images. The transcribed text is worth reading for several points, perhaps most notably for the comparison of all hanging ("suspension") with crucifixion. This is Galliano's justification for putting hangings first in his martyrology, because of the comparison with Jesus' death. This connects directly with Ross' quote from Alciato where the Hanged Man is referred to as the crux. Among other things, Galliano mentions St. Peter and St. Calliopus, who were crucified upside-down, and St. Gregory ("the Illuminator"), first Bishop to Armenia, who was tortured upside down. These have also been mentioned in regard to Tarot's Hanged Man. In 2005 Nancy Brown presented a couple pictures of St. Gregory enduring the second of his twelve tortures. They were from the Church of Saint Gregory in Ani, built by Tigran Honents in the 13th century, and are apparently from the same time. However, outside of martyrologies, images of torture and executions were symbols of justice, as shown in works like Lorenzetti's figure of Securitas holding a scaffold in his Allegory of Good Government, or Pisanello's hanged men outside the gates of Verona in his St. George and the Princess. The fact that these punishments were considered good things done to damnable sinners and criminals probably contributed to the artistic gloss which made their depiction so placid. 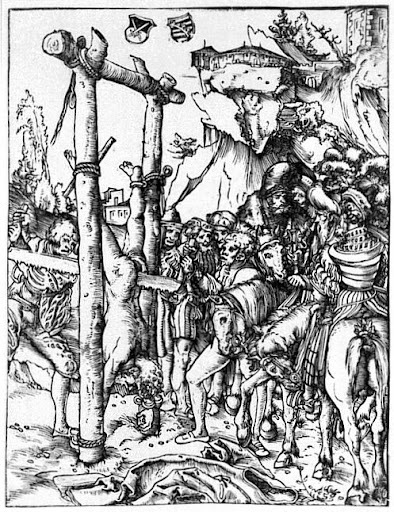 Speaking of horror shows, one of the best inverted torture-execution pictures is Lucas Cranach's depiction of the martyrdom of the apostle Simon the Zealot. Medieval legend had it that he was killed by Pagans who sawed him in half, and he was often depicted with a saw as his identifying attribute. But again, not just famous figures nor martyrs. For example, the legendary King David was pretty nasty in dealing with his (anonymous) foes. 2. Hanged by the neck for a short time or until almost dead. (hanged). 4. Beheaded and the body divided into four parts (quartered). Typically, the resulting five parts (i.e. the four quarters of the body and the head) were gibbeted (put on public display) in different parts of the city, town, or, in famous cases, country, to deter would-be traitors who had not seen the execution. 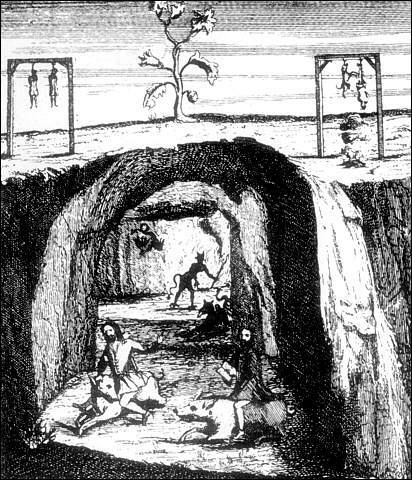 After 1814 the convict would be hanged until dead and the mutilation would be performed after death. Gibbeting was abolished in England in 1843. Drawing and quartering was abolished in 1870. The point here is that even into the 19th century, even in genteel England -- home of the Anglo/American legal tradition of human rights -- punishment for treason was taken quite seriously. The traditional neutering of Tarot symbolism by occultists, who find the Hanged Man and Death too repulsive to be anything other than arcane symbols of alchemy or some such nonsense, is historically inappropriate. Death meant death, and the Traitor was actually going to endure more than bad looks and harsh language because of a shame painting. THNX for the info Mj---still chills me to the bone and I understand the "logic." I am always shocked and dismayed by the degree cruelty that exists in our world and the degree to which people can be manipulated.